Walk a mile in the shoes of a spy! Or was it a kilometer in clogs? SPYFALL is an easy-to-learn card game of bluffing, probing questions, clever answers, and suspicion. At the start of each round, players receive a secret cardinforming them of the group's location – a casino, space station, pirate ship, circus, (30 unique locations!) – except that one player receives the SPY card instead of the location. The Spy doesn’t know where they are, but wins the round if they can figure it out before they blow their cover! Once per round, each player may accuse another player of being the Spy. If all players agree, the game ends and that player’s secret card is flipped up. If the Spy is captured, each of the Non-Spy players win the round. If a Non-Spy is revealed, the Spy wins. Finally, if the Spy figures out where they are, they can reveal their card and make a guess. If they're right, they win the round. If not, the Non-Spy players win. Spyfall is a party game unlike any other, one in which you get to be a spy and try to understand what's going on around you. It's really simple! 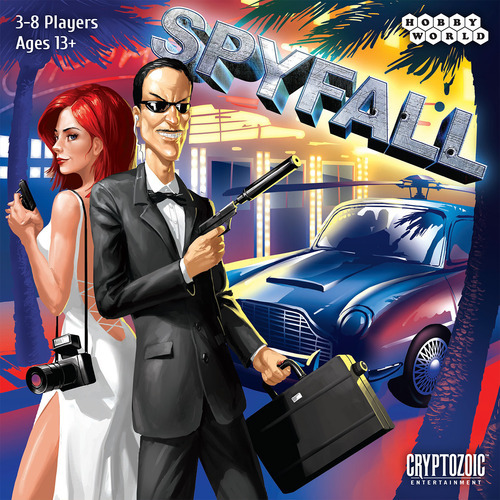 Spyfall 2 features the same gameplay as Spyfall with two important changes: (1) Enough location cards are included that the upper player count is now twelve instead of eight, and (2) two spies can be found at each location, giving all of the non-spy players more of a challenge when it comes to tracking down who doesn't belong. Get ready for an outstanding time, traveling across the brightest eras and countries! Expose a spy in a neanderthal cave or in a lunar base, hide out in a WWI Airship or in Leonardo's studio, and do your best not to spill all the secrets of the Japanese ninja or of a Spanish entity you surely didn't expect here!